Many students who come to college can be expected to§perform well. In fact, the admissions systems at§most colleges are set up such that students must meet§certain criteria before being accepted at that§particular institution. The admissions criteria§chosen by most colleges are believed to be predictive§of college performance. However, these estimates of§performance may not take into account other factors§related to later success in college. As such, some§students who are admitted into college under the§premise that they will be successful perform poorly§at the college level. Academic competence has been§proposed as an explanation for why some students§struggle unexpectedly. 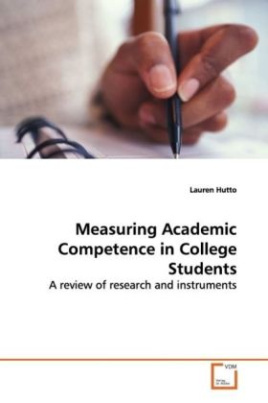 This work discusses factors§commonly associated with academic success and§explores the statistical properties of the Learning§and Study Strategies Inventory (LASSI) and the§Academic Competence Evaluation Scales (ACES) in§college students with and without learning §disabilities.